Philippa Leathers's debut children's book is quite the curious read. 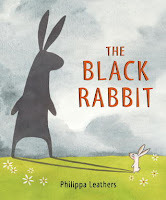 The Black Rabbit is a tale of Rabbit who believes he's being followed by a scary black rabbit. Rabbit is indeed afraid of his own shadow, but the catch of the story is that he never realizes that it's his shadow. The Black Rabbit is show of true imagination and humor. There will definitely be a divide between readers of this story. Younger readers will find no fault with Rabbit being afraid of his shadow, seeing it as the mysterious monster-like creature following the innocent little animal. On the other hand, older readers will understand why Rabbit can't get away from the Black Rabbit, but bow to the creative genius of Leathers's story. Leathers is also the illustrator of The Black Rabbit, and she does impressive work. The concept of the story is easily translated through the illustrations, which also add a bit of suspense. Even though Rabbit doesn't realize that he's afraid of his shadow, his fear is replaced by admiration. I had to laugh at the outcome of The Black Rabbit, because I really expected him to figure it out. Either way, I have no doubt that Leathers will continue to create such exciting and beautifully illustrated children's books!